Do you want to live off the grid for awhile? Maybe you’ve got a cabin in the woods or you’re just trying to do some homesteading, but either way, a composting toilet can make life a little easier. They even work in outdoor workshops and other areas where you could use an extra toilet! Best of all, they will help you turn liquid waste into liquid gold! 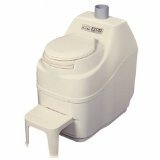 Composting toilet reviews are one of the best ways to select the toilet that will meet your needs most effectively. That’s where the chart below can give you a good head start. It will help you quickly select the toilets that will best work for you! What Makes For a Good Composting Toilet? There are two critical components of a good composting toilet. The first is that it must be able to properly seal the basin so that fumes are vented in an appropriate manner. If you don’t have a good seal, then odors will escape and that’s a smell you’ll remember for a long time! You’ll also need to have a good stirring mechanism so the composting process can work right. This can either be automatic or manual. If you’re looking to save a few bucks, go with the manual option. What Are the Benefits of Owning a Composting Toilet? The primary benefit of this technology is that you’ll turn your waste into something that you can really use. Peat moss is generally the standard recommendation to place in the basin, but there are a number of fibrous options that you can use to turn waste into fertilizer. You then empty the basin at regular points in time to empty it and you’ll have a powerful growing ingredient that will help your garden grow massively well! If you want to know more about this process, the EPA has a useful handbook on the topic on their web site. There’s also the benefit of being able to live off the grid. Composting toilets can be all-in-one manual models that require no electricity at all. You simply use the toilet as you normally would and then manually crank the stirring mechanism in the basin every so often. Look for designs that automatically remove liquid waste from the basin to maximize the effectiveness of the toilet. You’ll also discover that there’s a cost-savings benefit that comes with these toilets. Because they are water-free in almost every instance, you’re eliminating a massive amount of fees from your utility bill. The average cost savings is around $250 per year for most households, which means a composting toilet will quickly pay for itself. Are There Any Issues To Owning a Composting Toilet? Unlike your typical traditional toilet, there are more maintenance functions that must be performed on one that creates compost. You’ve got to stir the composting mixture regularly. You’ll need to empty out the compost at some point. There’s the added materials that must be included in the basin to create the composting effect. You must also vent the toilet appropriately and get air flowing over the compost so you can limit odors. Although it takes extra work, the payoff is in the cost savings. How Do You Find the Best Composting Toilet? The first consideration you need to take in shopping for a composting toilet is to get one that has a good venting mechanism. You’ve got to have air flowing over the compost being created, otherwise the odors are eventually going to escape and they can be quite overwhelming! That’s where our composting toilets reviews are really going to help you out. You’ll be able to discover which toilets are designed well, which ones could use a little help, and which ones are easy to maintain. The best composting toilets have automatic stirring mechanisms that work at the appropriate times. Although you can save some money by purchasing a manual composting toilet, if you forget to stir the compost, you can create a difficult situation in the future for yourself. The automatic ones take most of the work out of this process for you and that’s a good thing. Composting toilets are generally taller than your typical toilet as well, sometimes above 20 inches in seat height. That means you may need a stepping stool to reach the seat effectively, and they won’t be ADA compliant. Look for toilets that either have a strong step or stool in the design or allow you a good place to install your own so that you can reach your toilet safely. How Are Composting Toilets Installed? Most composting toilets can be installed by someone who has a few DIY skills. The primary work comes from the venting that must be installed. If you’re installing this toilet indoors, then you’ll need to either run the piping of the vent through an existing exterior vent hole or create one yourself. You may need to get a building permit to make an exterior home modification, so check with your local building codes first before starting this project. You’ll also want to have the composting toilet placed on a firm, flat surface. If you’re on even a slight incline, you’re going to put more pressure on one part of the basin’s seal and that can create a future problem which could eventually destroy the toilet and it would also void any warranty. Otherwise the installation process is pretty easy. You don’t need to worry about matching up the rough-in or plumbing up the toilet. 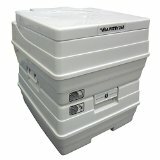 These units are all-in-one self-contained toilets that can generally be used right away upon delivery once you add composting foundations to the basin. Maintaining them is also quite easy, using just your basic environmentally friendly disinfectants. You’ll find in the composting toilet reviews here on this site that composting toilets are not generally what would be considered “cheap.” There are good composting toilets that can be had for less than $1,000 on Amazon right now, however, and most of the advanced models can be had for around a top price of $2,000. The primary feature that we really loved with this particular composting toilet is that it is specifically designed to be completely waterless. Unlike other toilets, the Nature’s Head toilet is designed to remove all water waste from when you go and it stores this waste separately. With the peat moss that’s included with the composting, you’ll find that by removing the water, this toilet has an amazing capacity that will reduce the amount of maintenance that is required. Instead of having to rely on a 12v battery or a solar power source, you can crank when needed and prevent many of the terrible odors that can be produced when compost isn’t properly shifted. 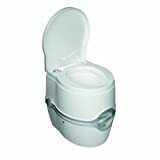 The toilet is easy to disassemble and then reassemble for those times when it does need to be emptied and this composting toilet comes with a vent hose and a fan in case they are needed for your specific setup. Although you’ll want to throw most of your paper away for a true composting experience, some lite toilet paper isn’t going to hurt the toilet in any way. It has enough capacity to work with a household of 3 year-round quite easily and can support up to 6 people over a brief amount of time. Are you wanting a toilet that uses no electricity, no water, but is still 100% non-polluting? 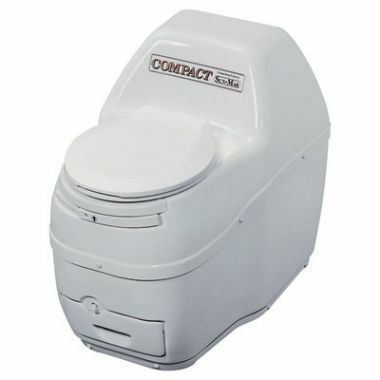 What you’re going to want to consider owning then is the Sun-Mar Excel composting toilet. This is a self-contained toilet that uses absolutely no water and no electricity so you can always have a place to go. It includes a variable diameter bio-drum as well so that processing compost is simple and easy. It includes a 4 inch venting kit that allows you to work on dispelling odors away from the unit. The step-up stool isn’t a particularly nice addition – a metal stool would be a better option, especially for larger folks. It feels unsteady at times as well and that can sometimes create an awkward sitting situation when it’s time to go. If you’ve ever had a portable toilet in the past, then you know how infuriating they can be. They can be so difficult to access that it makes digging a dirt toilet a better proposition! The quick release latches on this toilet, however, make maintaining this portable item a simple and easy chore, but not so easy that you’ll accidentally trip the releases while you’re transporting the unit. This creates an efficient experience that replicates a home-based toilet in virtually every way. There’s just one word of advice if you choose to use this particular portable toilet. The seals on it are so excellent that they even prevent air from escaping the unit. When the toilet heats up and the air expands, you’ll will find a high enough level of pressure that it causes a wonderful spray of waste to shoot straight at your face! We really love how this toilet sits at a regular height. Unlike other portable toilets, you won’t find a compromise in quality to achieve the added height either, which is a definite improvement. Are you ready to help the environment and save some money? Then you’re going to want to consider one of these toilets. Use these composting toilet reviews to select the perfect toilet for your home and property and you won’t be disappointed with the results!